It's been a watershed day, almost literally. The second of two big locks on our 20 mile trip took us from freshwater to saltwater. We set off from Willemstadt at 0930 just as the heat was starting to intensify. Soon we were at the first massive lock, Volkeraksluis queuing up to wait on a nearby pontoon. No-one seemed to know when the lock would be ready so we all waited with engines off. Then there was a stream of boats coming out of the lock from the opposite direction and we knew it was time to start up. 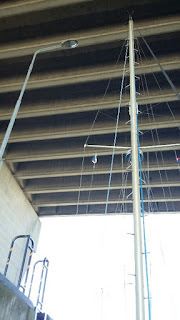 We counted sixteen boats in the lock ... some even rafted up. It was truly enormous. And on top a road bridge with the traffic thundering along. 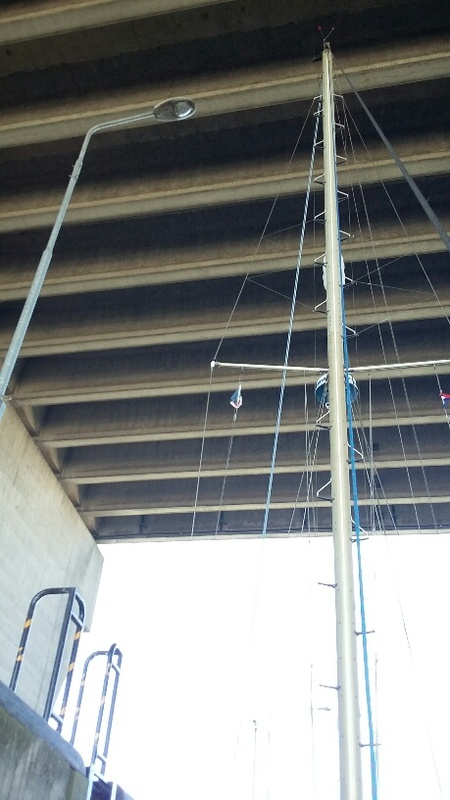 The clearance was given as 18.5m and we had measured our masthead to be 15m ... yet looking up it seemed awfully close. All was well though and half an hour later we had dropped all of half a metre and exited in a rush of boats. The weather was picture prefect with clear blue sky and just a breathe of wind. 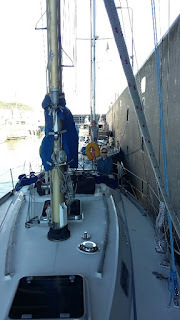 We're in wider waters now so sailable in principle - one boat tried a mainsail but we all kept motoring. It seemed to be a bit of a race down the Volkerak to the next lock. 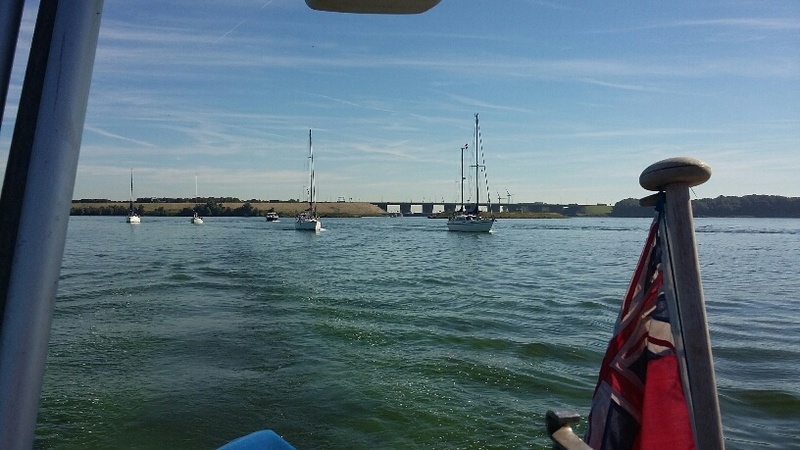 We kept to our cruising speed and let them go ahead, and when we reached the next lock it was green and they were piling in and we just squeezed in at the back. One smaller boat who was a bit slower didn't make it, and as he cut us up earlier we felt a quiet justice had been served. The massive lock gate closed just 1m behind us. Hare and tortoise job. This time we dropped more than a metre and emerged into salt water - L could smell it immediately. Out we all piled again and some went right to Bruinisse, some ploughed on down Mastgat perhaps with the next lock in their sights. We turned left into Krabbenkreek (honestly) and after a mile turned into a marina at Sint Annaland. I know this sounds like a pathetic theme park for someone called Anna, and there was nothing about it in our Cruising Guide, but their website looked good so we risked it. Wow, what a great find. Huge modern marina, finger berths, great facilities ... and a sandy beach on the river where we went for a swim. With temperatures reaching 30 it was very welcome. The heat sapped our energy though, we didn't make the long walk into the town. We could see the church spire and two windmills, standard issue pretty Dutch town. Instead we washed the boat and had a simple pasta meal onboard.